As music journalists scramble to fill up their top-ten lists for the best music of the ’90s, it’ll be fun to see how many of them include the joke-rock band Ween. 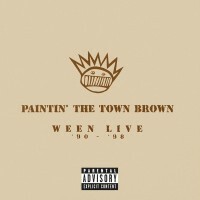 With Paintin’ the Town Brown: Ween Live ’90–’98, the brothers Dean and Gene Ween produce convincing documentation for posterity with a two-CD set of live material spanning the decade. With Casio beats and an irreverent approach to the guitar, Ween has always poked fun at rock and roll, but not without making some inventive, ridiculous music in the process. Disc one presents Ween in their many incarnations: steel-pedal-and-fiddle honky-tonk, cheesy synthesizers, and the topper: a DAT-tape backing band. Death metal meets ZZ Top on the down-and-dirty “Doctor Rock” and “Awesome Sound,” recorded in Amsterdam on one of many tours of the Netherlands. Disc two opens with a twenty-five-minute version of Ween’s anthem “Poopship Destroyer” and continues with two more epics, Ween style. The band may have started as a joke, but now the joke’s on you: at the close of the decade, Gene and Dean are still going strong with their twisted brand of music. Originally published in the Orlando Weekly on June 24, 1999.